Now that the 2016 season has come and gone, it is a good time to reflect on pest management issues and use information learned to improve our IPM program in the coming year. Navel orangeworm (NOW) appeared to be a significant factor again in 2016 in harvest damage assessments. Of particular concern was the earlier-than-typical, and in some cases, spread out husksplit observed in later varieties, which have historically been considered less vulnerable to significant levels of worm damage. A number of growers and PCAs were caught off-guard by the worm damage present in these varieties in 2016. Consider all varieties important for NOW IPM activities. These include sanitation, in-season monitoring, harvest timing, and minimizing other sources of in-season damage (codling moth, blight, and sunburn). 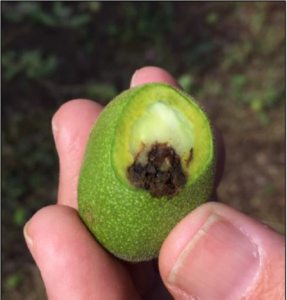 There were areas in the Sacramento Valley last year where early season hail storms caused damage to developing walnuts. This resulted in malformation, and in some cases, enough damage that as nuts developed, openings were left in the husk, providing a prime opportunity for entry by early season NOW. Although we cannot protect against hail storms, be aware of the impact they may have on NOW infestation. 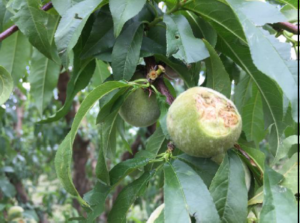 Hail damage to walnuts in May, 2016. Photo credit: J. Hasey. Walnut with damage from a hailstorm in May, 2016. Photo credit: J. Hasey. High NOW damage at harvest means the possibility of large overwintering populations. Keep in mind that the thicker shell of walnuts offers overwintering NOW more protection than the softer shell of almonds. Therefore, less natural mortality should be expected in walnuts, even in wet years, and mowing or discing walnut mummies should always be done regardless of weather conditions. This concept for adequate sanitation for NOW management in walnuts is not new. Research in the early 1990s by UCCE Advisor Steve Sibbett and Specialist Bob Van Steenwyk showed that increasing levels of walnut mummy destruction after removal from the trees resulted in greater reductions in emerged NOW adults. Mummy nuts were placed on bare berm, in weeds, double disked, or shredded. Over the two-year study, shredded nuts showed the highest levels of NOW reduction relative to those placed on bare berm (100% and 97%), followed by nuts double disked (95% and 68%), and nuts placed in the weeds (86% and 24%). Pheromone trapping for NOW in walnuts – what does it all mean? Well, the short answer is that we are still not entirely sure how to use the pheromone traps for treatment timing or thresholds for NOW in walnuts. The graph below shows season-long 2016 trapping data for six orchards spread throughout Butte and Glenn Counties. Trap numbers were relatively high during the first flight, less so during the second flight, and picked up in numbers again later in the season during the third and fourth flights. While research is ongoing to determine exactly how to use early, mid-, and late-season trap counts to inform NOW management activities, this suggests that there may be some value in monitoring traps season-long in walnuts, rather than focusing only on late-season trapping in early varieties. 2016 season-long NOW trapping data for six walnut orchards in Butte & Glenn Counties. 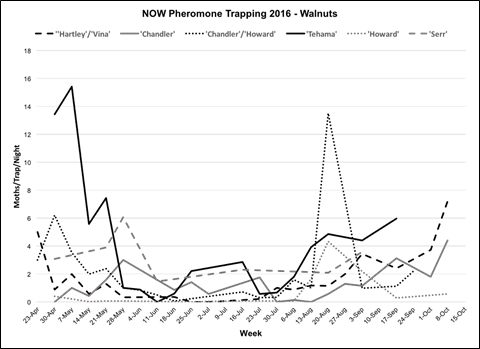 Pheromone trapping for NOW in walnuts – which lure works “best”? There are now four commercial NOW pheromone lures available: Suterra Biolure®, Trece Pherocon® L2 high and low amplitude, and AlphaScents Amytra®. In a study last season in Butte County, all four lures performed comparatively well in tracking male NOW flights relative to traps baited with live virgin females, and all exhibited the same lower trap captures during the second flight. There may be some value in consistency in your lure of choice, particularly when looking at historical trap catch data (year-to-year comparisons). If you decide to switch from one lure product to another, be sure to note the change along with any unusual observations that may be related to the new trapping method. With any lure, be sure to use according to its particular manufacturer specifications (replacement interval, etc.) and remember that storage and handling can affect performance. Some lures may be particularly “hot” when initially deployed, which can cause issues in interpreting trap catch data. This was observed in particular for AlphaScents Amytra® lures during the first week of deployment. To avoid misinterpretations caused by fresh lures (not just the AlphaScents product), consider opening and pre-aging the lure for a day prior to deploying in your field trap. In short, don’t take your eye off NOW in walnuts, no matter what variety you grow. Much research is still needed to determine the relative importance of a number of factors that may contribute to NOW damage (e.g., native versus immigrant populations; proximity to external sources; previous season’s damage; orchard sanitation; overwintering populations; in-season codling moth, blight, and sunburn damage; degree day accumulation; populations cycles in surrounding crops; harvest timing; ethephon application; pesticide choice and application timing; and various environmental conditions). In order to answer the outstanding questions, large data sets will provide the most value. If you would like to discuss the possibility of contributing data to further the cause, please contact me at ejsymmes AT ucanr.edu. All private data and site-specific identifiers will be kept anonymous.